Original products for every rider's levels! 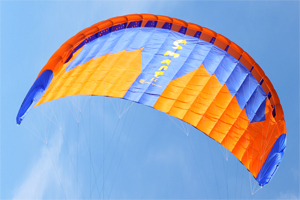 All around kite, great for all levels of riders. Easy to use, the Smart II will follow you throug every level of your progression in the sport, whatever you like Snowkiting or Buggykiting or both. Available in 2,5m, 4,5m, 6,5m, 8,5m, 10,5m, 12,5m & 15,5m sizes. 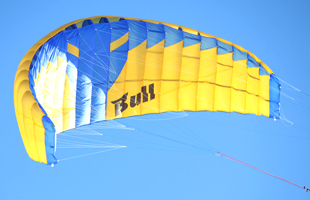 Our new beast for the 2013 winter: the Bull is an extremly fast and powerfull kite, giving breath taking performances! The Bull marks the beginning of a newlandkites generation, offering a more extreme feeling, for those riders looking for performances without compromise. On sand or snow, the Bull is gonna kick you solid! 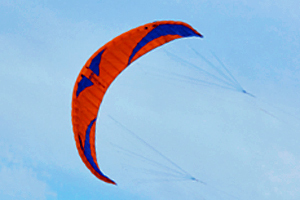 A dedicated race kite with amazing speed that is trully appreciated by the Buggykite racers. The Leader Se.X is a high precision kite that is build for speed and needs to be driven. Size: 3m and 5.5 Available only on special orders. 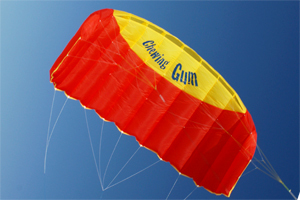 The Chewin Gum is the perfect training kite for anybody that wanna get the real feeling of flying a kite with a bar. Highly safe, very easy and absolutely funny, it is sold at an unbeatable price. The Chewin Gum is available in 3 sizes: 1m, 2m & 3m.